John Mark, also called Mark, was born in Cyrene to Aristobulus, a disciple of Christ, and Mary. She is mentioned in Acts 12:12 as the matron of the home where the early Christians gathered for prayer, where the Last Supper took place, and where the Christians met to pray for the Apostle Peter when he was in prison. According to Egyptian Christian tradition, Mark is the individual recounted in Acts 12:25 as accompanying the Apostles Paul and Barnabas on their journeys; he also traveled with the Apostle Peter to Rome. Based on what he learned from the Apostle Peter, he wrote the Gospel according to St. Mark. To avoid persecution in Rome, and at the Lord’s direction, both Peter and Mark went to Egypt. After traveling to Alexandria, they went to Babylon (not the one in present-day Iraq), where the Apostle Peter wrote his first epistle. St. Peter left his younger companion there and returned to Rome, where he was later martyred. 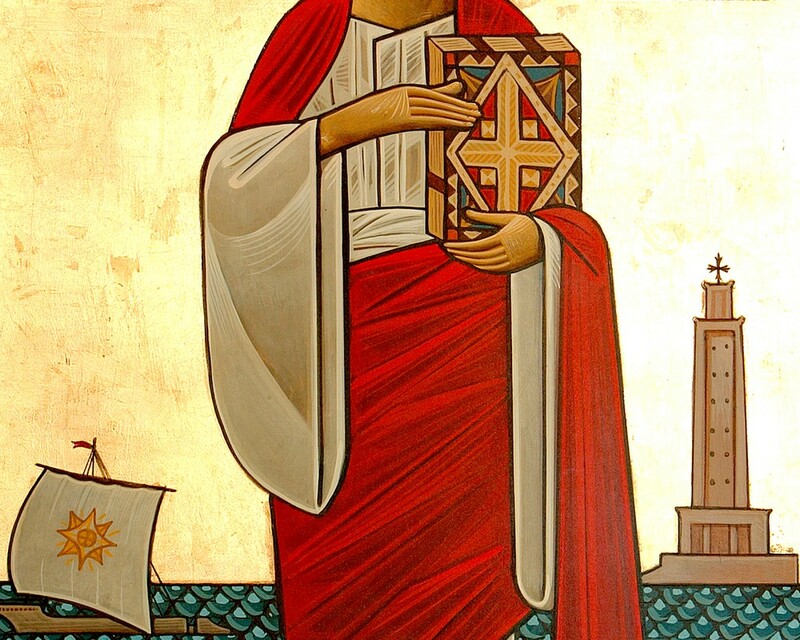 St. Mark established two churches in the Pentapolis of Libya between 56 and 60 A.D., and in 61 A.D., he returned to Alexandria. Upon entering the city, his first order of business was to have his sandal repaired, because it had become torn from his extensive walking while preaching and evangelizing. He brought it to a cobbler named Anianus. While Anianus was repairing the leather, his awl slipped and pierced his hand; in response, he cried out in Greek: “Eis Theos!” which means “One God!” When St. Mark heard this cry, he rejoiced and took advantage of the opportunity to talk to Anianus about the One God, Jesus the Messiah. He took clay and spittle and applied it to Anianus’ hand, praying the Name of Jesus Christ. The wound was immediately healed and as a result, the heart of Anianus was opened. After St. Mark recounted the gospel to him, Anianus took him home where he and his family were baptized. As the followers of Christ spread and multiplied in Alexandria, the hostility of the pagan community began to arise. They abducted St. Mark and, on a pagan feast day in 68 A.D., dragged him through the streets until he gave his holy soul into the hands of God. Prior to his martyrdom, St. Mark ordained Anianus Bishop over Alexandria, and ordained three priests and seven deacons. It is thus how the growing movement of Christianity in Africa was linked with the Apostles of Christ, through the hands of the Apostle and Evangelist Mark.